City landscaping can be boring. It is usually based on the idea of minimal maintenance, minimal plant cost, and marginally acceptable aesthetics. But occasionally, it surprises even me. I happened to pass by La Caixa opposite “Parque de las Naciones” in Torrevieja just as the magnificent Silk floss trees (Ceiba speciosa/Chorisia speciosa) were in full bloom. Whauw! I always notice how many of these trees there are around town when they are in bloom – there are more of them than we think. Considered one of the most beautiful trees in the world, the Silk floss tree is a deciduous tree and a member of the Bombacaceae, or cotton-tree family. 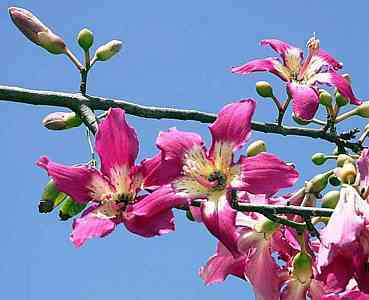 It is also known as "Floss silk tree” and "'Kapok tree". 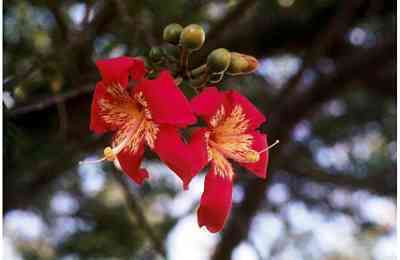 Its common name in Spanish is “Palo borracho” (drunken tree). The common English name of Silk floss tree is more readily understood as the seeds are surrounded by a white, fluffy, silk-like material. 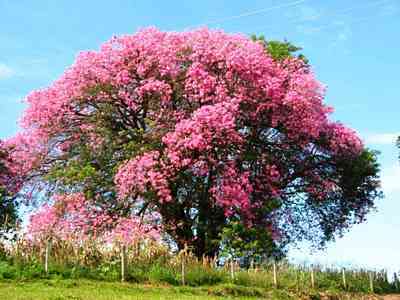 It is a fast growing tree ideal for spring and summer shade that can grow up to 60 feet (18 m) tall and almost as wide. A native of tropical climates of Brazil and Argentina, it prefers warm, humid environments, but can survive temperatures down to -7°C on an occasional basis, which means it survives fine here. Silk floss tree is known for its beautiful flowers, large seedpods with a silky, cottony substance (kapok) within, and large thorns that grow from the greenish bark of the trunk protecting the trunk and limbs. The thorns are cone shaped and make you think twice before becoming a tree-hugger or trying to climb it. There is also a grafted thornless variety, but I don't think they are as decorative as the spiny ones. In younger trees, the trunk is green due to its high clorophyll content, which makes it capable of performing photosynthesis when leaves are absent. With age it turns to gray. At full maturity the base trunk of the tree will become bloated with water – giving it a "bottle tree" look. The base fills with water storing cells causing the stretched bark to form green furrows along the gray bark. Pale green leaves will emerge from the tree in spring, and when the leaves drop in autumn, they are replaced by spectacular star-shaped flowers in shades ranging from creamy white, through varying shades of pink, to dark red or purple. The flowers are often compared to lilies or hibiscus. They have five distinct petals and may be 4 to 6 inches (10-15cm) across. The trees are very showy when in peak bloom. The older the tree, the better the flower display. The flowers are replaced by inedible, avocado shaped fruits up to six inches (15cm) in length. 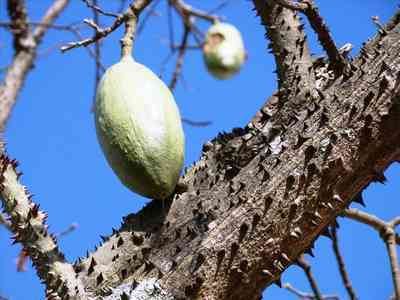 The fruit is a capsule, consistent with most trees in this family, and is filled with seeds embedded in silky, white floss. When mature, the pods split open releasing the seeds to be dispersed by the wind. 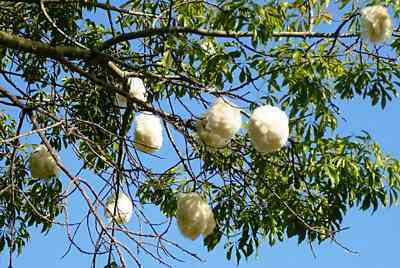 The cotton-like substance of the floss, or kapok, has very smooth fibres – regrettably too smooth to be spun into textile thread. Because of the fact that this material is lighter than cotton, more buoyant and much more resistant to saturation of water (the floss can support 30 times its own weight in water), the kapok was in earlier times harvested commercially for stuffing life jackets, seat cushions, mattresses and saddles. Propagation is usually by seeds. Sow seeds from spring to early summer. Use a mix of humus and garden soil. Plant seeds at 1 inch (2.5 cm) of depth and keep the plants at temperatures higher than 15°C. Water regularly, without letting the soil dry out for more than a day. Give your plants a rich fertilizing treatment once a month. Your seeds should germinate in 4 to 6 months, but it could be more - don’t get discouraged. Keep young plants away from strong winds, but always give them light and sun.The young trees start out growing fast, straight, and narrow, then slowly develop broadly spreading umbrella canopies as they age. 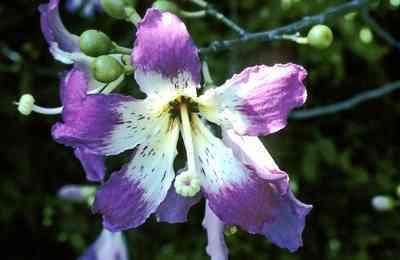 With individual trees grown from seed there can be variations in the flower colours; more pink, more rose, etc.